Virender Sehwag and Sachin Tendulkar dazzled with their bats to light up a dark and cloudy day and take India to an emphatic eight-wicket victory in the fourth one-dayer here today, establishing an unbeatable 3-1 lead. Virender Sehwag’s blistering batting ensured yet another victory and with it Indians are now certain not to lose the series having taken a 3-1 lead in the series with two matches left. Alla Tsuper of Belarus flies to a first place finish during women's aerials freestyle competition in Whistler, British Columbia on Sunday. New Zealand all-rounder Chris Cairns might miss tomorrow’s day-night cricket match against Australia at the Melbourne Cricket Ground because of concerns over a back injury. The home side, which will drop out of finals contention in the limited-overs tri-series with a loss, will bring in paceman Brett Lee and allrounder Ian Harvey for Jason Gillespie and Andrew Symonds. Without their ace batsman Brian Lara, the West Indies face a Herculean task as they get set to play a two-match Test series in the neutral venue of Sharjah against Pakistan who are fresh from a successful series albeit against a weak Bangladesh. The twice-postponed ATP World Doubles Tennis Championship 2001 will be held as a Challenge event here from tomorrow, devoid of ATP ranking points, but top-notch doubles players, including the Indian pair of Mahesh Bhupathi and Leander Paes, will be seen in action. Defending champions East Bengal failed to reverse their sliding fortunes at home as they were held to a 2-2 draw by a spirited FC Kochin in the National Football League at the Salt Lake Stadium here today. The McDowell Indian Derby is always associated with success; successful people, successful designers and successful race- goers. Fashion breeds success like any other art form. Mike Tyson goes before the Nevada Athletic Commission to obtain a boxing license here tomorrow but could face banishment instead of a $ 20 million payday in the wake of his latest controversy. 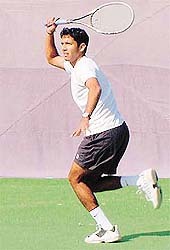 Third seed Saurabh Singh returns to Tushar Liberhan on the opening day of the ITF Junior tennis meet on Monday at Chandigarh. Saurabh defeated Tushar 6-4, 6-4. The first day of the ITF Junior tennis tournament which began here today at the tennis stadium, Sector 10, belonged to Chandigarh boy Chhatwinder Singh, who upset top seed Amanjot Singh, also of Chandigarh, in a gruelling encounter 7-6, 7-5. Government Model Senior Secondary School, Jalandhar, scored a convincing 4-2 victory against Chottu Ram Zamindar Senior Secondary School, Sonepat, to sail into the semifinals of the 30th Nehru-Nestle Junior Hockey Tournament at the Shivaji Stadium here today. Haryana Olympic Association will organise the state level panchayat tournament at Narwana in Jind district from March 2 to 4. Disclosing this here today, Mr Abhey Singh Chautala, president, Haryana Olympic Association, said the state government had issued directions to the Deputy Commissioner, District Development & Panchayat Officers and Block Development and Panchayat Officers for making arrangements well in time before the start of the tournaments. Sachin Tendulkar (L) and Virendar Sehwag take a run at the Green Park Stadium in Kanpur on Monday. Man-of-the-Match Virendar Sehwag acknowledges the crowd after completing his half-century at the Green Park Stadium in Kanpur on Monday. Virender Sehwag and Sachin Tendulkar dazzled with their bats to light up a dark and cloudy day and take India to an emphatic eight-wicket victory in the fourth one-dayer here today, establishing an unbeatable 3-1 lead in the six-match series. In a rain-curtailed 39-overs a side match, after containing England, who elected to bat first, to a total of 218 for seven, India achieved the winning target in just 29.4 overs with eight wickets in hand. It was raw aggression from the two lookalikes that took away the game from England by the 15th over itself when 125 runs had already been put on board. If England were looking for some miracle to happen, they were in for disappointment. Nothing could turn around their fortunes, not even the dismissal of Sehwag, who scored a blazing 62-ball 82 studded with 14 fours before being dismissed in the 18th over. The stocky Delhi batsman fully deserved the Man-of-the-Match award that came to him later. For England, the misery continued as Tendulkar was still there to contend with. The master batsman, on his way to an unbeaten 87 with 13 fours and a six, became the first batsman in the history of one-day cricket to cross 11,000 runs with his 48th run. That he also completed his 55th half-century was reduced to being a matter of trivia. And then there was Ganguly too who complimented his fine bowling effort earlier in the day with an attacking 26-run knock before getting carried away to gift his wicket. England were off to a similar start earlier in the day when their captain Nasser Hussain won the toss and made the obvious choice of batting first. It was opener Nick Knight who had a point to prove after his failures in all the earlier games. The 74-run knock of Knight solely helped England set an asking rate of 5.62 runs an over. That it was hardly enough for the Indians, England must have never imagined. Ganguly had yesterday hinted that Sehwag might be promoted in the batting order after his fine performance as an opener in Chennai but he had ruled out demoting himself to accommodate the Delhi middle-order batsman. However, a slight pull of the groin muscle, which had forced him to retire to the pavilion midway through his sixth over, ensured Sehwag once again walked out with Tendulkar to open the innings. And what a partnership it was! The 35,000 capacity crowd, which is used to watching its team win at this ground, was in a frenzy as Tendulkar and Sehwag unleashed a series of powerful strokes. The ball kept flying to all corners of the ground as the English bowlers were made to look like a bunch of amateur club-level cricketers. 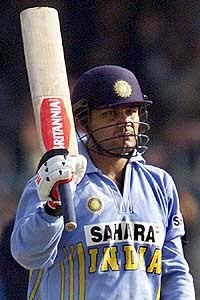 But for a change it was Tendulkar who was outscored by his partner as Sehwag simply cut loose against the England bowlers. Not even an Andrew Flintoff, who had restricted the run flow in a similar situation in Chennai, or a Jeremy Snape, who had dismissed both these batsmen in that match, could do anything and they were punished like anyone else in their team. It was 17 overs of pure, unadulterated stroke-play before Sehwag got a bit impatient and holed out a simple catch at mid-on to Mathew Hoggard off Paul Collingwood. However, unlike in Chennai, the Indian innings was never shaken. Ganguly, who made 26, played a few fine strokes and hit five fours in a brisk 45-run stand for the second wicket with Tendulkar. He stepped out to Gough while attempting a big hit but saw his stumps uprooted. But by that time India were well on course to victory. All that in-form Dinesh Mongia had to do was not to attempt anything silly and remain at the wicket with Tendulkar. In fact, the Punjab left-hander did better, playing some attractive shots to remain unbeaten on 17. Tendulkar then brought off the victory in style with a straight six off Snape that followed a four off the earlier delivery. Earlier, the Indian bowlers had fought back admirably to restrict England within manageable limits after Knight and Trescothick had given their side a flying start. Fall of wickets: 1-71, 2-111, 3-144, 4-151, 5-156, 6-166, 7-197. Bowling: Srinath 8-0-31-1, Agarkar 5-0-40-0, Harbhajan 8-0-40-2, Kumble 8-0-44-2, Ganguly 5.1-0-17-2, Sehwag 1-0-9-0, Tendulkar 3.5-0-17-0. Fall of wickets: 1-134, 2-179. Bowling: Gough 6-0-44-1, Hoggard 5-0-38-0, Flintoff 3-0-25-0, Hollioake 4-0-33-0, Snape 5.4-0-45-0, Collingwood 6-0-31-1. Virender Sehwag’s blistering batting ensured yet another victory and with it Indians are now certain not to lose the series having taken a 3-1 lead in the series with two matches left. He even overshadowed Sachin Tendulkar during their partnership, which is never an easy thing to do. The little champion did look a bit more pensive than usual and with the accidental death of his close friend, Mark Mascarenhas that was understandable. Those who know him would have also known that he would produce something special for his departed mate. But it was Sehwag, who stole the show with an array of shots that took one’s breath away, as much for the power of the shots as also for the simplicity of their execution. He once again gifted his wicket away unnecessarily and missed out on a certain century and though he may not feel too badly about it now, when he is 60 years old and reclining in his chair he may well rue that he missed out on what could have been another one-day century in his career. There was no pressure of a high asking rate and there was nothing remotely threatening about the English bowling and with the runs coming almost at will, the shot that he got out to wasn’t really required at all. It was an unforgettable innings which deserved to be crowned with a century. Tendulkar is far too experienced to get carried away or to feel insecure if the batsman at the other end is outscoring him and he played yet another capital knock. He got to 11,000 one-day runs quietly with a sigle but did not miss out on the scoreable balls and he finished the game in style with a boundary and sixer to score yet another emphatic victory for India. Such margins of victories are important from the morale point of view, for it not only gives the winning team the belief that they are that much better but it demoralises the opposition. The previous two victories have been by close margins, which have given England the hope that they can compete but this victory showed that India were much the superior side. For a change the Indian fielding also was top class and though not outstanding as the South African team it was one of their better efforts and what is expected in limited overs cricket. Their fielders didn’t hang around with the ball but had it on its way quickly, which made the batsman think again about going for the extra run and the catching too was true. “Sachin Tendulkar is my role model and I copy his shots,’’ said Man of the Match Virender Sehwag whose hurricane knock of 82 helped India win the fourth one-dayer against England at the Green Park stadium here today. “There was no pressure on me. I tried to make the most of field restrictions and played my natural game,’’ Sehwag told newspersons after the match. 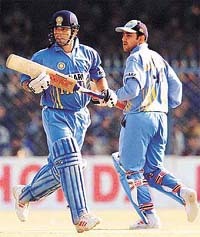 The duo of Sehwag-Sachin made 134 runs for the first wicket and put the team on road to victory and India led the six-match one-day series 3-1. The little champions had also contributed a fruitful 107-run for the opening wicket in the third match at Chennai, helping the hosts register a four-wicket victory over the Englishmen. “Besides, I am also happy because Sourav showed confidence in me as an opener and I will try my best to live up to his expectations,’’ he added. “The openers won the match for us. Though it was a good target to chase, Sachin and Sehwag batted with their grace and did what was expected of them,’’ said skipper Sourav Ganguly, who scored 26 runs and claimed two vital wickets before he suffered a minor groin injury while bowling. New Zealand all-rounder Chris Cairns might miss tomorrow’s day-night cricket match against Australia at the Melbourne Cricket Ground because of concerns over a back injury. The home side, which will drop out of finals contention in the limited-overs tri-series with a loss, will bring in paceman Brett Lee and allrounder Ian Harvey for Jason Gillespie and Andrew Symonds. New Zealand captain Stephen Fleming said Cairns was receiving intensive physiotherapy today on a disc problem. “He’s probably ginger, would be the best word to describe it. He probably suffered a little bit with his bowling,” Fleming said. The $ 350,000 event sponsored by telecom giant Bharati Group to promote their brandname “Touchtel” will be more a tennis carnival with the Karnataka State Lawn Tennis Association (KSLTA) throwing in fashion shows in between the matches and music to make the event a memorable one. The scenic KSLTA stadium inside the Cubbon park would not only reverberate with the powerful game of the top-notch players but also blare popular western music over the next five days as the world’s top eight teams would be split into two groups named ‘Bharati’ and ‘Touchtel’ and play on league basis. The top two from each group would qualify for the semi-final knock-out. The draw was slated for late this evening. The last of the ATP tour event, the World Doubles had to be called off last year following the September 11 terrorist attack in the USA and the subsequent tension in the sub-continent. The KSLTA, in view of the security situation, had initially sought postponement and later cancellation of the event. However, Indian Tennis Ambassador Vijay Amritraj impressed upon the ATP for holding the event as a Challenge Championship and the tournament was got up in less than 15 days with the Bharati Group agreeing to be the main sponsor. A question mark hangs over the participation of Zimbabwean pair of Wayne Black and Kevin Ullyett who finished fifth last year and the US-Australian combination of Jeff Tarango and Michael Hill, ranked ninth. However, Tournament Director C.G.K. Bhupathi said there would be no problem for the event to kickstart tomorrow as two alternate pairs — John Laffnie De Jager and Robbie Koenig of South Africa and Tom Vanhoudt (Belgium) and Chris Haggard (South Africa) — had already arrived in the city. Other prominent pairs to be seen in action are Wimbledon champions Donald Johnson and Jarred Palmer of the USA, currently world ranked two, French Open finalists Bob Bryan and Mike Bryan (USA), Peter Pala and Pavel Vizner of the Czech Republic (seventh) and Mark Knowles and Brian Macphie (Bah/USA) and former champions Rick Leach and Ellis Ferreira (US/SA) ranked 10th. The home team, who had lost four matches in a row, raised hopes of arresting the losing trend as they led by a solitary goal till the half time before the visitors bounced back to share points. Stricker Dipendu Biswas put East Bengal in the lead as early as the 15th minute but the Kerala outfit changed the complexion of the game with two goals in quick succession through Koluthungan and E. Mohammad. The hard-working Jiten Rai restored parity for the home side in the 74th minute. Desperate to regain their winning touch, East Bengal launched into the offensive starightaway by initiating a barrage of raids from both the flanks, keeping the rival defenders on tenterhooks for most part of the opening session. East Bengal’s new coach Subhas Bhowmick tried out a few new tricks but a few costly lapses by the defenders resulted in another disappointing show by the defending champions. With this drawn encounter, East Bengal have collected 11 points from 10 matches while FC Kochin have secured 10 points from as many outings. MUMBAI: Local outfit Mahindra United’s fine run continued when they beat Punjab Police 2-0, after a barren first half, to top the table at the Cooperage here. Striker Bala Osman and substitute S. Venkatesh were the scorers. Mahindra United and Indian Telephone Industries (ITI) are tied on 19 points each after playing 10 matches each but the Mumbai outfit has a better goal difference (plus 7) to ITI’s plus 6. The first half saw Mahindra miss many chances with their striker Austin Okolo being the main culprit. In the fourth minute of the match, Mahindra Defender Khalid Siddique’s cross was wasted when mid-fielder Abhishek Yadav’s header went over. Five minutes later Mahindra mid-fielder Jules Alberto Dias shot over a rebound but Punjab Police custodian Satish Kumar warded it off easily. MARGAO: Ghanian Abdul Ganiyu Saley scored a hat-trick and Yusif Yakub scored a brace as Zee Churchill trounced HAL at the Nehru Stadium here. Zee Churchill, who led 4-0 at half time, scored through Abdul Ganiyu Saley (2nd, 9th, 22nd), Yusif Yakubu (12th, 67th) and substitute Inacio Afonso (85th). The McDowell Indian Derby is always associated with success; successful people, successful designers and successful race- goers. Fashion breeds success like any other art form. It reflects the economic situation of the world in general and as we step into the next year, the battle-torn scenario has thankfully not affected trends in fashion. Happy colours, a profusion of detailing, interesting silhouettes and a strong presence of party clothes are what one expects to see at the McDowell Indian Derby this year. In Indian wear, the fitted hip-hop look replaces the tent like structure of kalidar kurtas. Short, tight fitted shirts worn over cigarette styled pants or patiala salwars replace the churidar. The fabrics bring in a feel of stretch, with silk making way for lycra and crepe, while cotton is replaced with the feeling of sheer, personified by nets, chiffons and tissue. Layering in sheer fabrics, an inter-play of tonal forms are in, as the dupatta shortens in length and is replaced by a much manageable scarf. As hemlines get straight, silhouettes simplify and stylish detailing replaces the opulence of Rajwada feel embroidery. Dr. Vijay Mallya has always promoted successful and upcoming designers and the McDowell Indian Derby has always set trends for the fashion industry. In 2002, the straight dress reigns supreme, whether long or short. The silhouette is cylindrical, fitted to form and totally symmetrical. Yes, while last year asymmetries and bias cut reigned supreme, this year the simplicity of the straight line has taken over. For the day of the McDowell Indian Derby, solids are deeply recommended. Basics like a tailored black trouser, knee length straight skirts and a short jacket with interesting flaps and pockets are a must for the race - goer. Go a little more formal in the realm of power dressing and what gets recommended are tweeds in Scottish checks and animal prints. Detailing – right from shoes, bags, belts, hats and jewellery every single accessory is perfectly co-ordinated. That’s what dressing for success is all about ! From gold-dipped threads, rich vintage brocades, intricate and unusual beading, handcrafted embroidery, sheer georgette and chiffon layering and the most breath-taking lace imaginable, every garment is made with great precision, keeping in mind every intricate detail. An experience that will transcend all tangible levels of sense and sensibility and spiral you towards the allusive nirvana, a term frequently used in fashion circle. In the second set Amanjot’s aggression spilled over to objectionable remarks against the referee and chair umpire which disrupted the match for five minutes. Amanjot lost his temper and with that also the match. In another crucial tie between local boys, third seed Saurabh Singh had to come out firing on all cylinders to dispose of national under-16 champion Tushar Liberhan in straight sets 6-4, 6-4. Saurabh, a student of local S.D. College, will now have to carry his form to the next rounds as the city has pinned hopes on him. In the girls section, top seed Isha Lakhani and second seed Parul Goswami won easily to advance to second round. Boys: Chhatwinder Singh (Ind) b Amanjot Singh (Ind) 7-6 (4), 7-5; Lior Barbash (Isr) b A. Aziz (Uzb) 7-6 (2), 6-3; Abhay Prakash (Ind) b V.M. Ranjeet (Ind) 6-2, 6-2; Divij Sharan (Ind) b Harris Enandat (Ina) 6-2, 6-3; Al Imran (Ina) b Jitin Bishnoi (Ind) 6-2, 4-6, 6-4; W. Dor (Isr) b K. Boris (Croat) 6-4, 6-2; Nihal Advani (Ind) b P Kunshub (Thai) 6-1, 6-4; Ivan Kokurin (Uzb) b Paras Thakur (Ind) 6-1, 6-3; E Provowo (Ina) b Laser Miki (Isr) 6-0, 6-3; I. Prokoso (Ina) b Edward Khan (Uzb) 6-3, 6-1; Kiran Kumar (Ind) b Arkamondal (Ind) 6-4, 2-6, 7-6 (3); I Amit (Isr) b Manjeet Singh (Ind) 6-2, 6-0; Saurabh Kohli (Ind) b Ivan Kovalev (Kaz) 6-4, 1-6, 6-3; Jaco T Mathew (Ind) b E Gerad (USA) 6-1, 6-0; Somdev K. Verman (Ind) b Asaf Cohen (Isr) 7-5, 5-7, 7-6 (3); Saurabh Singh (Ind) b Tushar Liberhan (Ind) 6-4, 6-4. Girls: Isha Lakhani (Ind) b Nivedita (Ind) 6-0, 6-0; A Elina (Uzb) b P Sharanya (Ind) 7-5, 6-1; Rushmi Chheda (Ind) b Satvika Saboo (Ind) 6-0, 6-2; S Sandra (Ind) b Swetha Devraj (Ind) 6-2, 6-4; Chen Yan Chong (China) b S Punamreddy (Ind) 6-3, 6-0; Maya Rosa (China) b Alipt Sandhu (Ind) 6-0, 6-0; Mariya K (Kaz) b Samrita S (Ind) 6-1, 6-3; Nidhi Shah (Ind) b Reenu Jai Kumar (Ind) 6-1, 6-3; Sanaa Bhambri (Ind) b Hwang Hsuan (China) 6-3, 6-1; Parul Goswami (Ind) b Bahaar Paul (Ind) 6-1, 6-2. In other matches, SGPS Academy, Sri Bhaini Sahib, trounced V S Agriculture Senior Secondary School, Khera Garhi, Delhi, 8-0 in pool B while Army Boys Sports Company, BRC Danapur, edged past St. Ignatius High School, Gumla, 2-1 to make the last four grade. In a pool D match, Government Model School, Jalandhar, scored two goals in the space of nine minutes to lead 2-0. Yadwinder Singh scored the first goal in the fifth minute while Major Singh hit home the second goal in the 14th minute. After taking a 2-0 lead, the Jalandhar school relaxed the grip and the Haryana school made use of the freedom to penetrate the rival defence and pull one back through Sumer Singh in the 24th minute. A minute after resumption, Baltej Singh converted a penalty corner to make the score 3-1 and Parladh Singh also converted a penalty corner to enchance the lead to 4-1. But at the fag end of the match, the Sonepat school scored their second goal through Sanjay Kumar to make the scoreline look much closer (2-4). The Jalandhar school topped Group D, logging six points. Haryana Olympic Association will organise the state level panchayat tournament at Narwana in Jind district from March 2 to 4. Disclosing this here today, Mr Abhey Singh Chautala, president, Haryana Olympic Association, said the state government had issued directions to the Deputy Commissioner, District Development & Panchayat Officers (DDPOs) and Block Development and Panchayat Officers (BDPOs) for making arrangements well in time before the start of the tournaments. He said for holding block level tournaments from February 1 to 3 an organising committee would be constituted under the chairmanship of the Sub-Divisional Officers (Civil) & Block Development Officer would made by the panchayat concerned. Competition at the block, district and state lavel tournaments (for men and women) would be organised in disciplines of kabaddi, volleyball, wrestling, athletics, cycle, tug-of-war (men and women) for Panches and Sarpanches of block samities and zila parishad members. Matka race for women, cart, camel and horse races would also be organised.